One of the pleasures of the late Patrick O’Brian’s novels about the British navy during the age of sail is O’Brian’s enchantment with the fascinatingly diverse world we inhabit. Travel widely enough with him and you encounter sultans and pashas, geographical marvels and zoological specimens, bejeweled parasols, Hamlet’s grave, hussars, Cossacks — maybe even a unicorn. Not to mention the vast blue sea and the splendid vessels that traverse it! O’Brian’s twenty-volume Aubrey-Maturin series — published from 1970 to 1999 — is beloved by its many devotees because its wonders seem endless. Its pages span the globe as they fill the heart. It does not hurt that O’Brian writes prose as near to perfect as Jane Austen’s or Henry James’s. But with more cannon. O’Brian drew inspiration, as his novels’ charmingly fastidious prefaces suggest, from firsthand accounts: of naval actions, certainly, but also of leisurely travels. 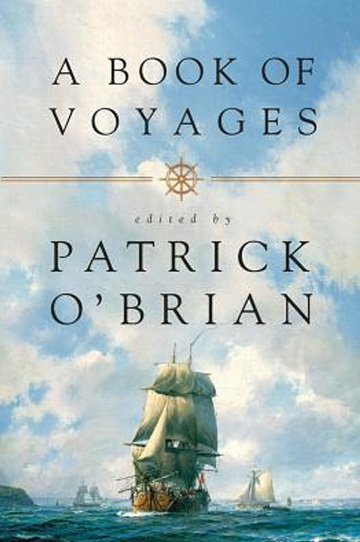 A Book of Voyages is a collection of excerpts from his favorite civilian primary sources. It has just been published for the first time in the United States. It is well worth having, and for much more than the sheer joy of finding a new book with O’Brian’s name on the cover. Its main contents are travel diaries and correspondence from the seventeenth and eighteenth centuries. O’Brian’s dry section titles — “Pleasant Voyages,” “Unpleasant Voyages” (most of these end in cannibalism), “Oriental Splendor,” “Inefficient Pirates” — give a sense of the delights within. Editing the volume for its British publication in 1947, O’Brian set out the ground rules. These are half the fun. The collection’s purpose is amusement: “If the reader draws instruction or edification from it as well as pleasure that is his own affair, and beside the bargain.” As in the Aubrey-Maturin novels, block quotes from the Latin or French are not translated; one must be cosmopolitan and lettered enough to muddle through. As to footnotes: “There are no footnotes except those of the original authors. Editor’s footnotes seem to me out of place in a work of this kind; they spoil the impression of reading the original text, they ruin the appearance of a page, and if they tell you anything new it is often annoyingly trivial.” I never met a curmudgeon so near to my own heart. Ellipses — “the usual dots” — are to O’Brian “the scars of editing,” and also best avoided. A Book of Voyages‘ loveliest contributor is the Right Honorable Elizabeth Lady Craven, who wrote a series of letters describing her journey from the Crimea to Constantinople in 1786. “Lady Craven managed to attract a great deal of ill-natured scandal,” O’Brian notes, for she was both beautiful and indiscreet. Her letters are observant, funny, and acerbic. “The Russian peasant is a fine, stout, straight, well-looking man; some of the women, as I said before, are uncommonly pretty; but the general whiteness of their teeth is something that cannot be conceived.” The Germans “are naturally musicians” — so said she, traveling through the very same Germany and Austria where Mozart and Haydn then lived and where Bach had lately died. In her amusement with foreign customs and her intolerance of bureaucratic rites, she perhaps provided O’Brian material for the character Diana Villiers: raven-haired beauty, impetuous lover, wife to Stephen Maturin, and inspiration to men everywhere. The Aubrey-Maturin novels feel thoroughly authentic, and some of O’Brian’s favorite eighteenth- and nineteenth-century tricks are on display here, ripe for stealing. The words handsome and pretty are given their full meanings, rather than reduced to measurements of men’s and women’s attractiveness: the emperor’s hunting tents “made a very pretty appearance,” for example. Correspondents, writing in longhand, would occasionally augment a description under the guise of self-correction: “she had a girdle, or rather hoop”; “the aforesaid vest, or upper-garment,” etc. And Lady Craven herself would use a handful of disembodied impressions separated by dashes, an impatient, kaleidoscopic method that was one of O’Brian’s favorite devices: “The Polish ladies seem to have much taste — magnificence — spirit and gaiety — they are polite and lively — excessively accomplished — partial to the English.” But O’Brian’s writing style was all his own and featured many idiosyncrasies that make no appearance in A Book of Voyages. These include his fondness for a string of adjectives, unsullied by commas, like the “fine great monstrous sea pie” that Jack Aubrey planned to make from the contents of his larder. “With all my heart,” said Stephen, poising his bow. He paused, and fixed Jack’s eye with his own: they both nodded: he brought the bow down and the ‘cello broke into its deep noble song, followed instantly by the piercing violin, dead true to the note. The music filled the great cabin, the one speaking to the other, both twining into one, the fiddle soaring alone: they were in the very heart of the intricate sound, the close lovely reasoning, and the ship and her burdens faded far, far from their minds.